Congratulations to the General McLane Wrestling Team - Wrestlers of the Week for Week 10!!! 2006-07 WRESTLER of the WEEK! Cyrus Parlin. Went 2-0 opening week. Scored a 3-0 win over 2 time D10 Champ, Steve Mancuso at War at the Shore, then followed with a 4-2 win over Bellefonte's Nathan James. Clay Steadman. Went 5-0 @ the McDowell Tournament with 3 pins and a major. He scored a huge 10-0 win over 12th ranked Travis Reed (St Marys) in the finals. Tyler Bowers. Posted his first varsity win on the mat with an 11-3 major over Steve Knapp. He gave an all out effort in what should have been a key swing bout against Conn. Lake. Seth Stonis. Placed 6th at the Tool City Tournament... had wins over #6 seed, Justin McAninch (DuBois), Connor Gibbons (St. Ignatius) & Zac McManus (Howland). Keith Scharrer. Went 7-0 with 7 pins at the Corry Duals. Six of Keith's seven pins came in the first period. Those 7 pins were good for 42 team points. Lou Decker. Lou went 5-0 with 5 pins at the Lewistown Duals. Lou's 5 pins brought his career total to 50, putting him at #7 on the all time list. LeRoy Jenkins. LeRoy won the Cranberry Invitational J.V. Tournament on 1/27/07. He went 4-0, posting 3 falls and a major decision. Keith Scharrer. Keith looked very impressive beating North East's Tony Langdon, 14-3. He's also won 14 of his last 15 bouts. Ethan Polaski. With his team trailing Saegertown 23-7, Ethan pinned Kyle Hudson and started a GM rally that would result in a come from behind win. Glen Sult. With his team leading Saegertown by a mear 9 points with two bouts to go, Glen came through with a match clinching pin over Pat Byham. The McLane Wrestling team. All 14 wrestlers contributed to a team effort which resulted in a second straight District 10 AAA title. AAA #16 Ryan Walters, Latrobe, AAA#11 Erik Galloway, State College. AA #12 Tyler Myers of Penns Valley. Beat AA #15 Dominick Demor, Southside. Clay Steadman (#21) beat (majored) AAA #12 Travis Reed, St. Marys. Cyrus Parlin beat AAA #24 Nathan James, Bellefonte. Ashton Osterberg 125 Theil College DIII. Update: Ashton wrestled to a fifth-place finish at the the NCAA D III Midwest Regional Tournament and finished the season 22-11. Nice season for Ashton. Hudson Harrison 157/174 Mercyhurst College DII. Two-time NCAA qualifier, Hudson won a hard fought 2-1 decision over Gannon's A.J. Sayles at War at the Shore, then followed that by going 5-0 and winning the Northern Ohio Invitational! He beat #1 seed Corey Murphy of Theil in the finals. Hayden Harrison 157 Embry Riddle Aer. University NAIA. Hayden went 5-2 at the Las Vegas Invitaional and just missed placing. He lost a close match to ASU's top-ranked D1 wrestler. Hayden then helped lead his team to a couple of wins against Menlo and Mo. Valley with a major and a tech fall. Hayden went 3-2 at the Reno Tournament of Champions. Hayden was selected to represent Embry-Riddle at the inaugural Collegiate All-Star Challenge. Hayden won a wild, 21-17 decision over Cal State Bakersfield's Jeremy Doyle on January 4th. Hayden placed 2nd at the NAIA Western Regional Tournament. 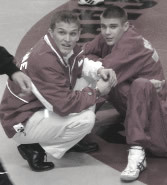 Update: Hayden won the 2007 NAIA 157 lbs. title...CONGRATULATIONS!! Hayden was Runnerup at the NAIA Championships in Sioux City, Iowa in 2005! Hayden helped his team to a top 5 finish, one of the best in the school's recent history. Hadley Harrison 149 Clarion University D1. Hadley went 4-2 with 2 pins at the Penn State Open. He also helped Clarion defeat American International and Duquense with a tech fall and a pin in his last 2 bouts. Hadley went 3-2 and finished in the top 8 in the Reno Tournament of Champions. Update: In dual meets against Davidson and Buffalo, Hadley went 2-0 in a 1-1 week for the Clarion Golden Eagles. Hadley pinned Davidsons Scott Matthews at 1:24 to help guide Clarion to a 33-12 victory. He then posted a 12-3 major decision over Buffalos Ryan Needle in a Clarion loss. 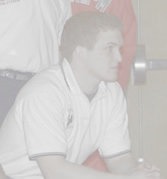 Hadley was selected as the PSAC Wrestler of the Week for the week of January 9th, 2007. Hadley placed 5th at the PSAC Championships (1/26-27/07). He just missed making the finals when dropped a 5-3 decision to Bloomsburg's Matt Moley in the semi-finals. Clarion lost their final dual meet of the season, 40-6 to Lock Haven, but Hadley beat former PA. state champ, Donnie Ament 5-3. Update: Hadley placed 6th in the EWL Tournament. 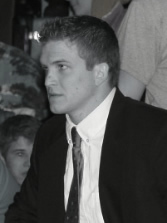 Branden Stearns 184 Brown University DI.